Now for something different, at least for me. This is my first knitted hat! 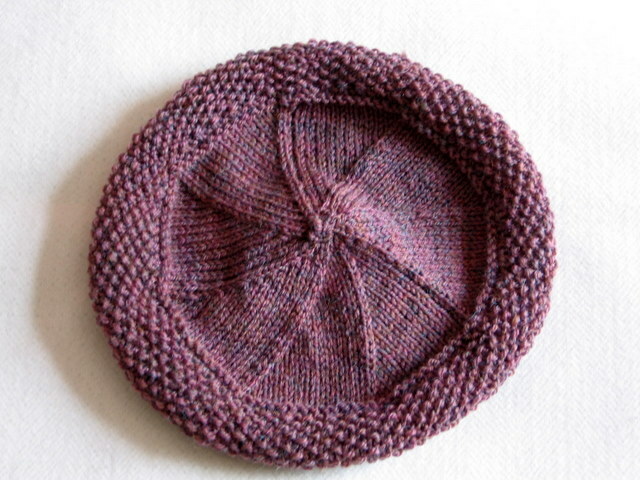 This is the Basic Tam with Flowers (minus flowers, because I decided against them) from One Skein Wonders. 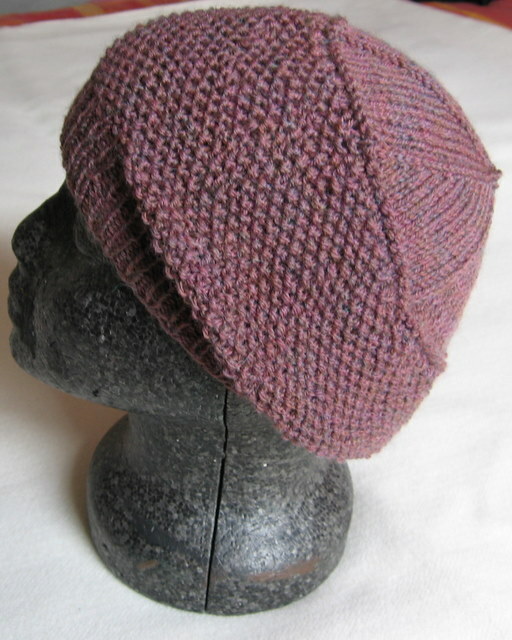 It's knitted in the round, initially on 4mm DPN's, but I switched to 5mm for the main body of the hat to make it a little larger without increasing the number of stitches. The main problem from my viewpoint was keeping the tension even as I changed needles - I can mostly manage it for a sock, but working on such large (and slippery) needles presented a whole new challenge. Otherwise, it knitted up OK - except where my attention lapsed momentarily causing me to slip into rib for a whole round and only notice some 10 rounds later, which meant ripping it back. Minor mishaps aside, it did finally come together and I managed the decrease at the top without incident. The slippery needles did give me a few hair raising moments in the last few rounds when having only a few stitches on each needle meant their was little friction and the stitches were prone to falling off the non-working needles! The yarn is a wool/acrylic mix in DK weight purchased from Busy Fingers over two years ago. 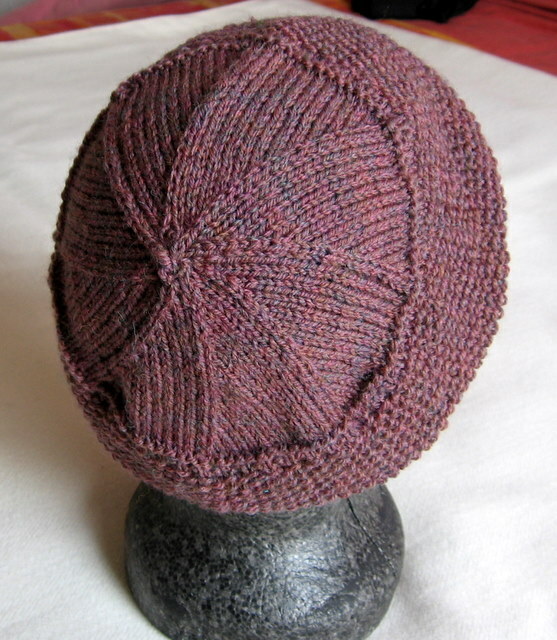 It was a single skein that I found in their bargain bucket by the door and as you can see it is a wonderful colour. A sort of brownish pink with flecks of red, blue and green worked in... Or as Dave named it, mouldy raspberry (Mouldy Rasp-Berret?) - he has a way with words, doesn't he? A nice, simple hat. 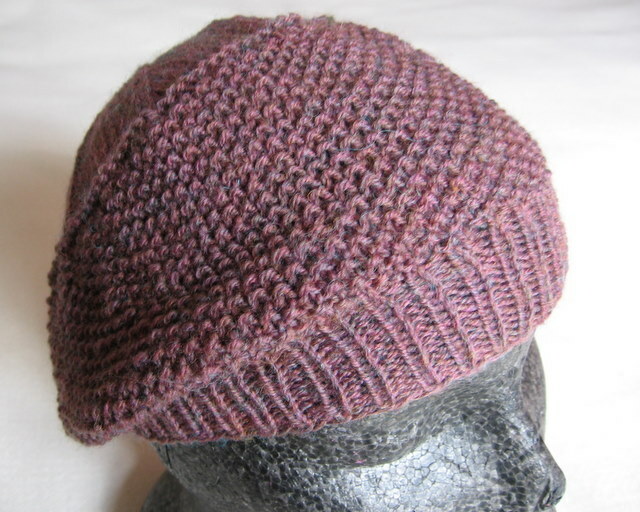 A quick, easy knit and very effective - I like it. That looks excellent to me, I like it, is it for you to wear, a present, or just for the knitting experience? Richard - it is most likely intended as a Christmas present for my aunt.